There are so many breeds and crosses that it’s hard to know which ones to choose when researching how to start a cattle farm. Cattle farming for beginners requires researching dozens and dozens of beef breeds and composites, and a half dozen major dairy breeds. There are also a number of minor breeds that are often more attractive to the small farmer than they are to the big producer. You may want to raise animals that are bred for beef or dairy, or you might want a dual purpose type of cow that provides enough milk for your family and also a good beef-type calf to butcher. What you select will depend on how much room you have and whether you want to have a small dairy or a beef herd, or just a cow or two to produce your own meat or milk. The many breeds and types of cattle have a wide variety of characteristics that make them unique. Some are better suited to certain environments or management systems than others. Some of the older breeds are less popular today and small in number, but this does not make them any less suitable for beef production (or for dairy purposes on a small scale or for a pasture dairy). Under certain conditions, one of these breeds may fit your goals better than a more popular breed. You may want to take a look at some of the minor breeds, or crosses that utilize these breeds, when choosing animals that might best fit your interests, environment, resources, and ability to care for the animals. Since there were no cattle in North America when settlers first arrived, they brought the breeds they were familiar with-from the British Isles or Europe. In more recent years cattle from other continents have also been imported, such as zebu cattle (including the Brahman) from India/Africa, the Wagyu cattle from Japan, Watusi from Africa, etc. The many beef breeds have differences in size (height and body weight), carcass traits (lean or fat), color and markings, hair coat and weather tolerance, and so on. Most cattle are horned and some breeds are polled. Some of the horned breeds have had Angus genetics infused into them in recent years, so the offspring are now polled and black-two traits that have become popular with many stockmen. In some of the traditionally red, horned European breeds like Salers, Gelbvieh, Limousin and Simmental, you can now choose black, polled versions if you wish. Beef breeds are stockier and more muscled than dairy breeds. The latter have been selected for their milking ability rather than for beef production and the cows are finer boned, more feminine and have larger udders-giving much more milk. Many beef breeds were originally bred for large size and great strength so they could be used as draft animals to pull carts, wagons and plows, as well as for beef. When animals were no longer needed so much for draft purposes (after the invention of farm machinery and trucks), these large, heavy muscled animals were no longer used as oxen and were selectively bred just to create beef. Many breeds (including Shorthorn, Brown Swiss, Simmental, Gelbvieh, Pinzgauer, Tarentaise) were used early on for milk and meat. Some of these breeds were later split into two registries, with different selected types for either milk or beef, while others are now raised mainly as beef animals. In Europe, for instance, the Simmental is a dual purpose dairy animal whereas in North America the breed has been more selectively bred as just a beef animal. The Shorthorn, on the other hand, has a registry for milking Shorthorns and another registry for beef Shorthorns. Even though some breeds are similar in color, they are not the same in other traits. If you are familiar with the typical “type” and conformation of certain breeds, you can readily differentiate between a Red Angus and a red Limousin, Gelbvieh or Salers. These breeds have differences in body build, frame size, bone size, etc. Most of the modern, popular beef breeds are larger in size (and wean bigger calves) than some of the more rare and “old fashioned” breeds, but in many instances the latter can serve your purposes on a small farm-requiring less feed and often less care. 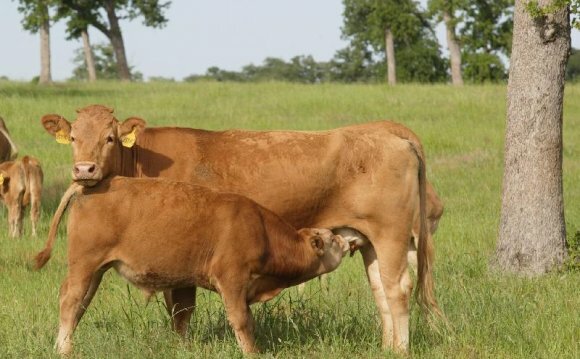 If you want cows that can do well in a pasture dairy (using grass rather than grain) or are interested in producing beef in a natural environment or on a small farm or in a sustainable agriculture system (with minimal inputs), one of the minor breeds may work well for you. This type of production system often demands different qualities than do the intensive confinement systems that are common in modern dairies or beef production. Animals for low-input sustainable production must have the ability to flourish on forages alone, with greater forage efficiency, parasite and disease resistance, hardiness, maternal abilities, good fertility under marginal conditions, and longevity. Many of these qualities have been ignored or minimized in popular breeds used for maximum production. Selection emphasis in modern breeds has been on fastest gain, higher weaning and yearling weights, or (in the case of dairy cattle) more milk production. Cattle have been bred for these traits, thinking these animals would be most profitable. Stockmen working toward maximum production overlook the fact that maximum profit may not come from the animal that grows biggest the fastest (or gives the most milk)-if there’s more cost and labor involved. Often the hardier, smaller cow that needs less feed (and continues to produce calves and keep up an adequate milk flow on inexpensive grazing-without purchased feeds or grain and supplements) is more profitable. Organic Farming - How to avoid worms in Cattle Organically.